31st of March 2017 – An iconic and world class Computer Science hub has been opened at Queen’s University Belfast. 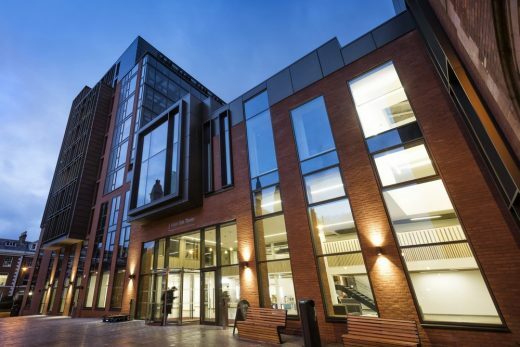 The University has invested £14m in the state-of-the-art building, which is supporting the expansion of computer science – an institutional priority for the University. The hub was officially opened on Friday (31 March) by Ian Loughran, a Queen’s graduate who is now Head of Americas Sales Operations at Google. STEM subjects are increasingly important to Northern Ireland’s economy and are currently in demand in the local labour market. As the engine house of Northern Ireland, Queen’s is working with key industry players to ensure graduates are highly trained and employment ready. 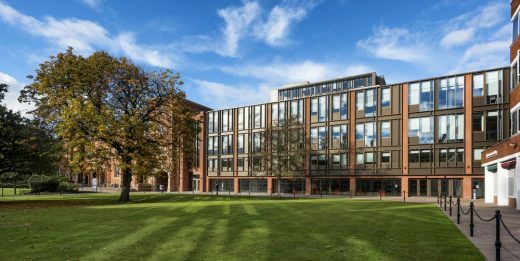 President and Vice-Chancellor of Queen’s, Professor Patrick Johnson, commented: “This investment by Queen’s is part of the University’s £700m Capital Development Programme, which is transforming our campus and continuing to develop as a university that is a beacon of leaning and innovation. 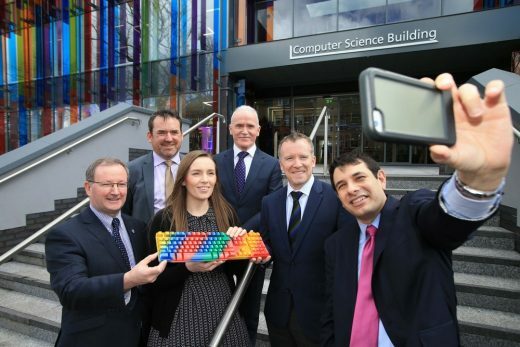 “The colourfully-redeveloped Computer Science Building will allow the 1,000 students reading computing-related subjects to have access to state-of-the-art facilities. The impressive design fits the requirements of our world class University and supports our outstanding students and staff in conducting leading-edge education and research, focused on the needs of global society. The redevelopment was completed in nine months, its modern and colourful exterior boasts glass fins which represent digital code– a main mathematical aspect of computer science. 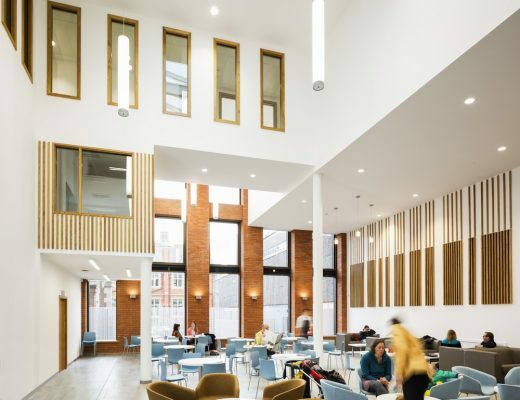 TODD Architects have recently completed the transformation of the northern portion of Queen’s University’s main campus on University Road in south Belfast. 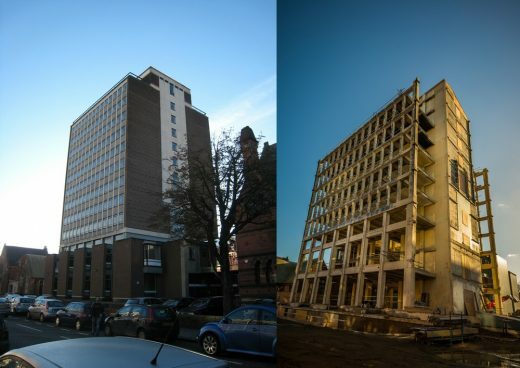 • Partial demolition, restructuring, refurbishment and extension of a vacated 1960’s multi-storey library stack into a new home for the University’s highly respected School of Law. • Linkage of the Tower with the adjacent Peter Froggett Centre (PFC), another incongruous 1960’s building, to form a new hub for the Faculty of Arts, Humanities, and Social Sciences. 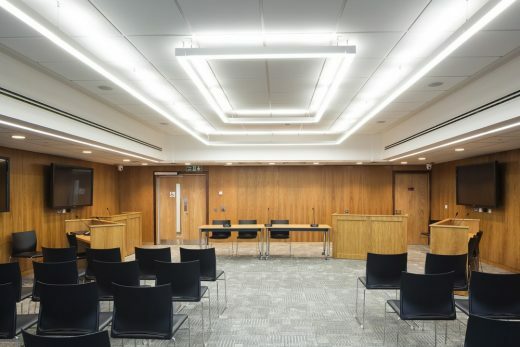 • Comprehensive refurbishment of the lecture theatres and classrooms within the PFC and re-facing of its primary elevations. • Refurbishment of the listed Lynn Library into a new Graduate School (completed under a separate contract by Consarc Conservation). • Hard landscaping around the buildings, including the provision of a new north-south link across the campus and the creation of new areas of public realm for staff and students. The work on the tower and the integration of new and old (in a building with a typical floor to floor height of only 2700mm!) 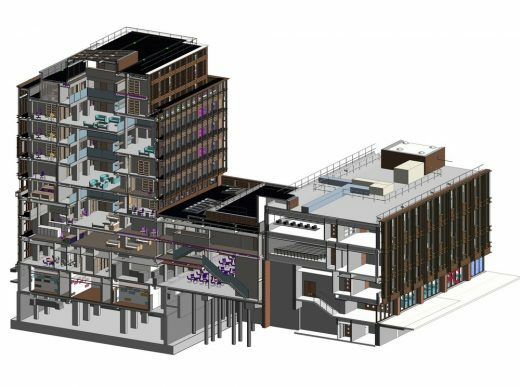 presented particular challenges – where a BIM Model was critical to both design and construction teams in ensuring effective co-ordination between structure, services and fabric. The uppermost three storeys of the tower were demolished, the building stripped back to its concrete frame, openings cut into floor slabs (to facilitate the creation of ‘mini atria’) and a steel frame clipped onto each of the existing elevations to increase the available developable footprint. The new complex is entered through the linkage established between the tower and the PFC, identified as a triple height space with bridge links extending between the two elements. In addition to its circulatory function, the area contains a café and informal meeting/study spaces for the entire Faculty. Direct access to the adjoining quad is provided through a secondary entrance hall, formed at the junction of the PFC and the adjoining (listed) Naylor Arch. A free standing feature stair sits as a focal point within the space. 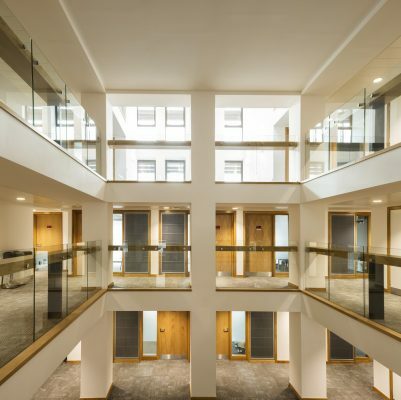 Classrooms, seminar rooms and lecture theatres (the latter refurbished within the PFC) are located on the lower levels, with PhD students and academic office acccommodation predominating over the upper floors. These individual spaces are arranged around mini atria that introduce natural light and at their bases create informal meeting and study areas. Externally the tower’s façades have been refaced in a restricted palette of materials – red clay brickwork, glazed screens and bronze anodised panels. They have been sensitively composed in different patterns in each elevation to respond to the particular context and orientation. Broad brick reveals and soffits, combined with extended curtain wall capping pieces provide a depth and layering to the facades consciously echoing the Victorian detailing of neighbouring buildings. 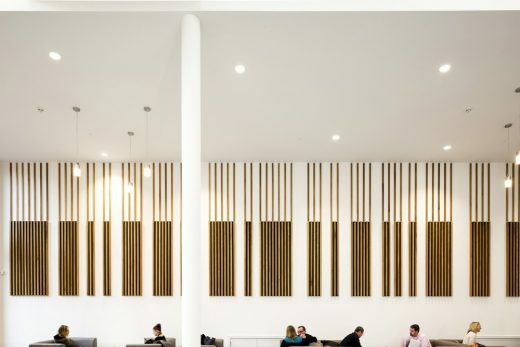 The southern face incorporates a double skinned façade, that in conjunction with the atria and bespoke designed acoustic dampened louvered panels to the offices, form part of a natural ventilation strategy within a low energy design solution that has achieved a BREEAM ‘Excellent’ rating. The same combination of external materials has been extended into the re-facing of the PFC, establishing a coherence in the architectural composition. Demolition commenced in the summer of 2014, with the main contract starting in the autumn of that year and work being handed over in phases, with full occupation by the University in September 2016. 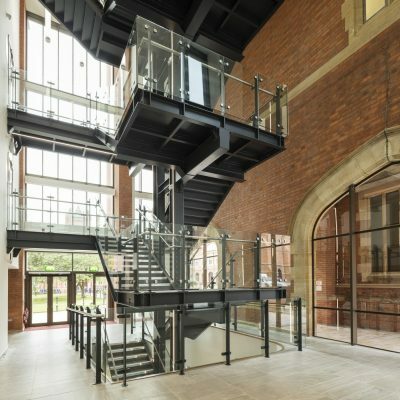 12 October 2016 – TODD Architects have recently completed the transformation of the northern portion of Queen’s University’s historic main campus in south Belfast. 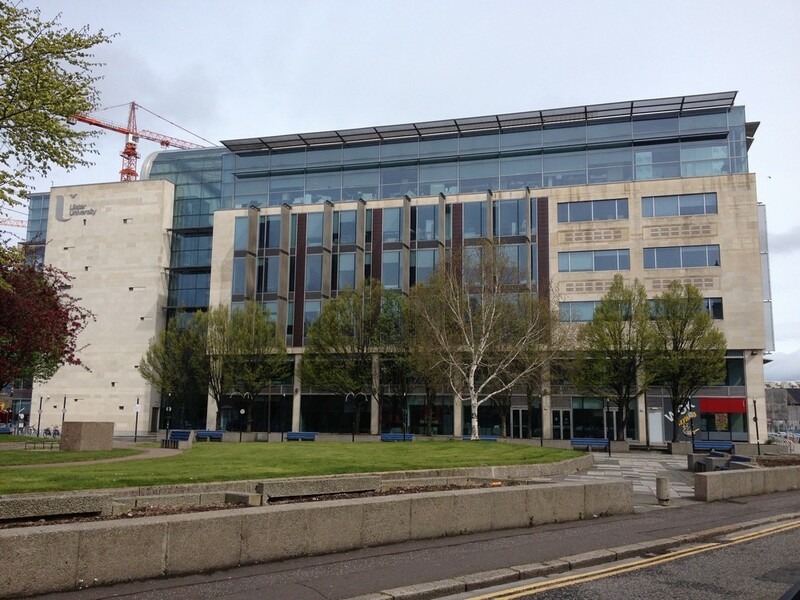 The redevelopment included partial demolition, restructuring, refacing, extension, refurbishment and linkage of an incongruous 1960’s multi-storey library stack and teaching centre, into a new home for the University’s highly respected School of Law, a Faculty hub facility, and a series of centrally bookable lecture theatres and teaching spaces. • Mini-atria within the tower where informal engagement between academics and students is encouraged. • Traditional’ classrooms arranged to allow differing group teaching and learning configuration. 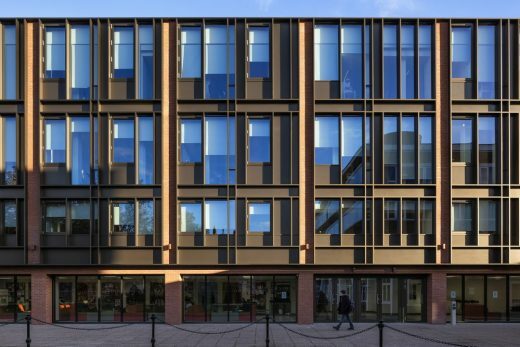 Externally the building’s new and refaced elevations were composed in a consciously restricted palette of materials – red clay brick brickwork, glazed screens and bronze anodised panels. They were carefully arranged in different patterns responding to their particular orientation and layered to provide a depth to the façade echoing the Victorian detailing of neighbouring buildings. 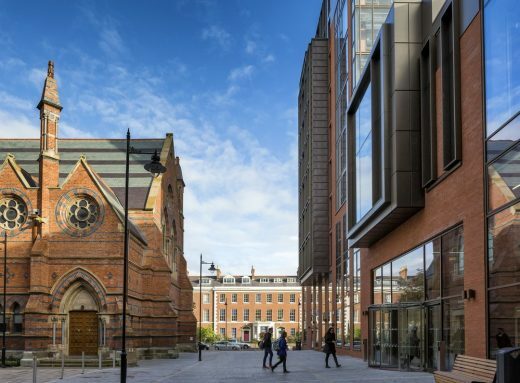 Queen’s University is one of the great architectural set pieces of Belfast, its imposing front façade instantly recognisable and often seen on bank notes and tourist posters and even serving as the backdrop for Northern Ireland news in Moscow. Queen’s, however, is much more than just the original Lanyon Building. The campus contains hundreds of buildings, of which over 100 are now ‘listed’ as being of special architectural and historic merit. It is not just the buildings, but also the spaces between them – the quadrangle, the trees and broad avenues – that contribute so much to the character of this distinctive part of south Belfast. The campus is an architectural treasure trove. The original campus is centred on the Lanyon Building. It should take no more than half an hour for a quick tour of the area, though you may well want to linger and enjoy the ambience. The centrepiece and the enduring symbol of Queen’s University is the original building completed in 1849 and now known as the Lanyon Building after its architect, the renowned Sir Charles Lanyon. The then Queen’s College was established, along with colleges in Cork and Galway. A site in the southern suburbs of the rapidly expanding city was chosen, close to the Botanic Gardens. Charles Lanyon, then County Surveyor of Antrim and already a well-established architect, was chosen to design the new college. His design, borrowing from the general Gothic and Tudor character of the great medieval universities, and in particular from Magdalen College, Oxford, reflected the ethos of the age where architecture used historical associations to create an instant authority and presence. The soft red brick and sandstone mellowed quickly to create a timeless pedigree and the long west facing front elevation conveyed a size and status reflective of the ambitions of this new establishment. The Lanyon Building Entrance Hall, or ‘Black and White’ hall as it has become known, was originally intended to have a large traceried window and doorway on the east wall, leading to the planned examination hall projecting into the middle of the quadrangle.